So the freezing temperatures aren’t letting up and I’m having trouble believing Spring will ever come. I decided this week to take a break from my honey comb and bee design. I have purchase my wool for the project and nailed down the final design. I only have to figure out the gauge and start writing the actual pattern. I’m very excited about working on it. I’ve also started collecting inspiration for a variety of other projects and would like to join some Craftsy classes to help me create my own designs. Time is my biggest enemy. I just don’t have enough of it. Do I really have to have a full time job? Sadly yes, if I want to help support my family. Taking a break didn’t mean no knitting. I grabbed a bunch of left over cotton from a project I did many years ago and started making dishcloths (except that variegated blue yarn which is of all things Phentex – that will used to make pot srubbers). I love making these because I can tryout interesting stitches and since they knit up so fast they give me instant gratification. In the past I feel I’ve made my cloths too small so these new ones are going to be much larger. I also want to make placemats. One of my biggest pet peeves about placemats is that they usually are made of materials or fabrics that are difficult to wash. I figure if I knit some out of cotton I can machine wash them without them distorting in size and shape. Previous: Is Spring really coming? 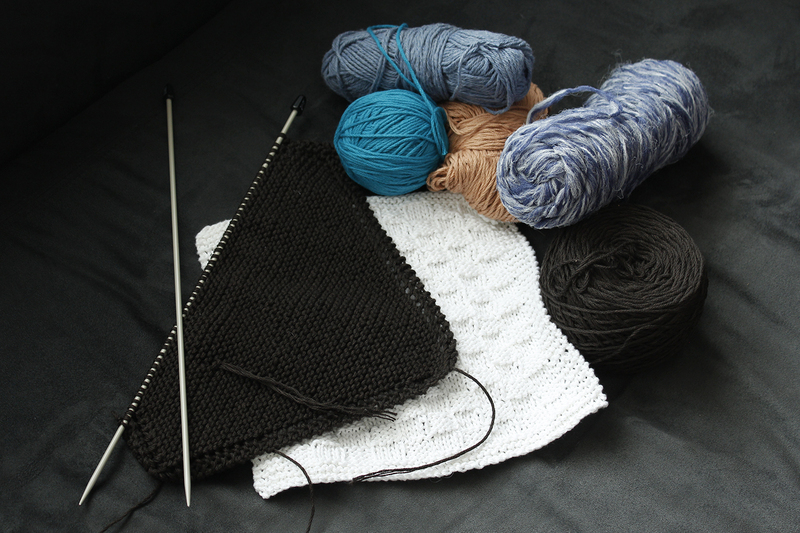 Next: Yarn, needles and projects oh my!